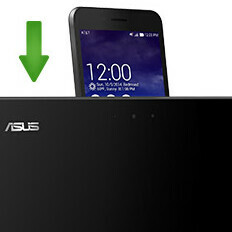 AT&T and Asus are sure taking their sweet time before launching the PadFone X. The new smartphone-tablet hybrid device was announced in the first week of January (four months ago), and there is still no word on exactly when customers will be able to buy it. But AT&T keeps on teasing the device. We saw a few promo videos of it lately, and today another one was posted by AT&T on YouTube. The idea of the new video is far from being brilliant, basically telling male customers that they can “get the girl with the Asus PadFone X.” Apparently, girls should be impressed by the fact that you can dock the 5-inch PadFone handset into the 9-inch tablet accompanying it. The PadFone X will run Android 4.4 KitKat at launch, supporting AT&T’s new LTE-Advanced network. Other features include a quad-core Snapdragon 800 processor, 13MP rear camera, 2MP front-facing camera, 2GB of RAM, and 16GB of internal memory. The PadFone handset has a 2,300 mAh battery, while the tablet dock offers and extra 4,990 mAh battery. Pricing details are missing at the moment, but we should probably expect AT&T to sell the PadFone X for a lot of money. Specs are already obsolete before release, way to go ATT. Well I wouldn't say obsolete but they could be more up to date... Anyway this may be a good start for ASUS in the US.... neither their smartphone fan base or their hybrid phone/tablet product are mainstream, but this could really get the traction needed for them to risk more there... maybe bringing Infinity models that compete to HTC M8 in build quality. Plz, the infinity line far surpasses the HTC phones in built quality (don't know about the X though). But this is meant to be more an upper mid range phone compared to the Infinity line which is meant to be cutting edge so the specs are where they need to be for the release window it is aiming for. Also, girls are totally impressed by that docking action (guys are too but they play it cool), they don't see that coming at all (plus there is a subtle innuendo there). We assume those are the actual specs, even though they are based on tests from a prototype model. Keep in mind that they could very well have changed, especially given that ASUS never confirmed any specs at the unveiling. More dumb stuff from Asus. Putting aside the fact that the market for this docking monstrosity is a very narrow niche, the technological approach is shortsighted. They should just put USB3 on the device and then it could be docked with any of the tablets that support USB3. Or a laptop. Or a docking station with all sorts of ports. While this would require a cable, it would open up a much wider set of value propositions. All the USB3 docking stuff is already sorted out, so the technology is cheap and off the shelf. And if Asus really wants to do modular stuff with pluggable components, they should get into Project Ara.